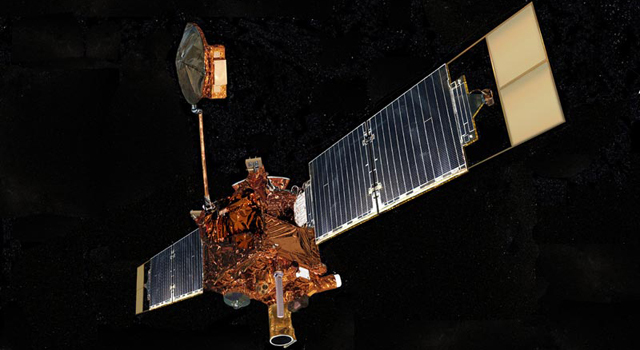 News | The Seven Sisters Pose for Spitzer - and for You! The view is quite different from what you might see if you look out to the west shortly after dusk. 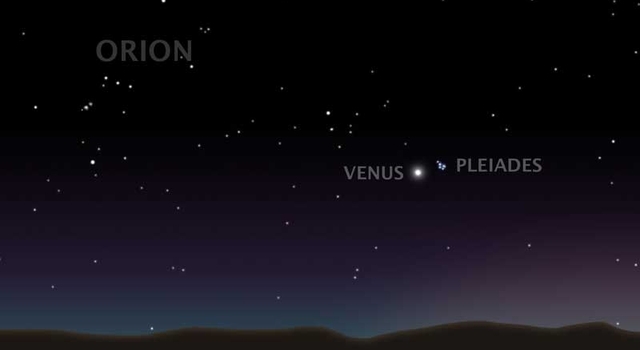 Right now, the famous family of stars is "stepping out" in the evening skies with a very bright and dazzling Venus. During the period from around April 10 to 13, the Pleiades shine like a cluster of diamonds just above Venus. On April 19, the crescent moon will join the party, sliding between Venus and the Pleiades for a special viewing. The new infrared image from Spitzer highlights the "tangled silver braid" mentioned in the poem by Tennyson. This spider-web-like network of filaments, colored yellow, green and red in this view, is made up of dust associated with the cloud through which the cluster is traveling. The densest portion of the cloud appears in yellow and red, and the more diffuse outskirts are shown in green hues. One of the parent stars, Atlas, can be seen at the bottom, while six of the sisters are visible at top. Additional stars in the cluster are sprinkled throughout the picture in blue. The Spitzer data also reveal never-before-seen brown dwarfs, or "failed stars," and disks of planetary debris (not pictured). 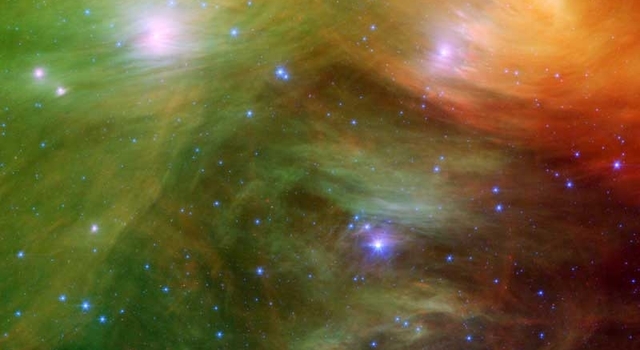 John Stauffer of NASA's Spitzer Space Telescope mission says Spitzer's infrared vision allows astronomers to better study the cooler, lower-mass stars in the region, which are much fainter when viewed in optical light. Stauffer, who admits to being biased because the Pleiades is his favorite astronomical object, says the cluster is the perfect laboratory for understanding the evolution of stars. This image is made up of data taken by Spitzer's multiband imaging photometer and its infrared array camera. Light with a wavelength of 4.5 microns is blue; light of 8 microns is green; and light of 24 microns is red.